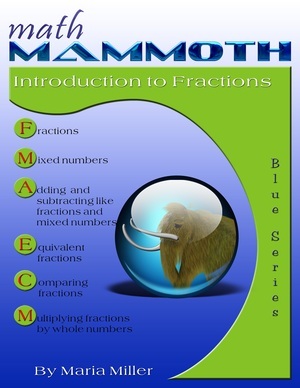 Math Mammoth Introduction to Fractions - self-teaching workbooks. Learn and understand fractions visually. 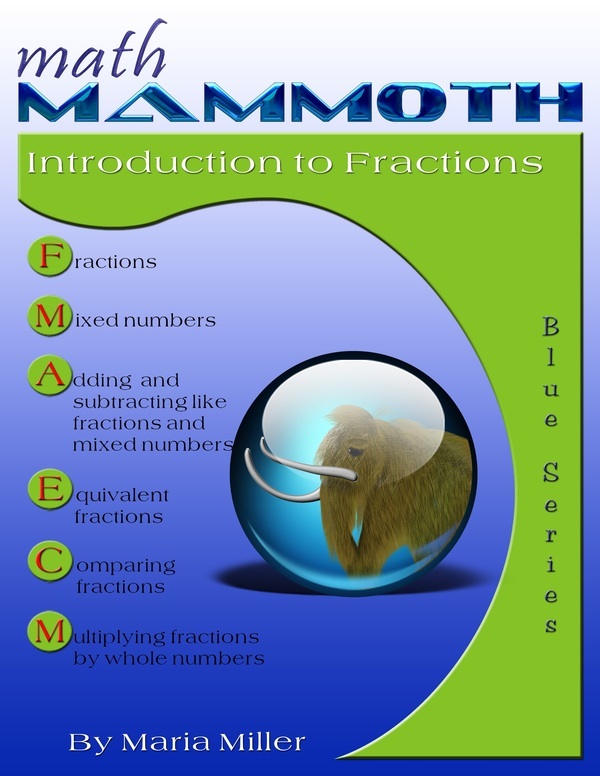 Math Mammoth Introduction to Fractions contains lessons for fraction arithmetic for grades 1-4. This material does not include division or multiplication of fractions, nor adding unlike fractions, which are topics for 5th and 6th grades. Also, most of the material here is for 3rd and 4th grades, and only a few lessons are meant for grades 1-2. The topics covered are on a simple level, constantly illustrated with visual models, and with small denominators. The presentation avoids spelling out specific rules for manipulating fractions, but instead relies on the usage of pictures on a very concrete level. Children easily confuse the various rules for fraction arithmetic, because there are so many. There is a place for the rules, as shortcuts for ideas that are already understood, but we do not start with them. The goal is to let the big ideas sink in conceptually first, followed by some shortcuts. The lessons are organized by topic, not by increasing difficulty. For reference, 1st grade students study only the concept of one half and one fourth. In 2nd grade, they study the concept of a fraction and optionally the easiest (first) lesson on comparing fractions. In 3rd grade, students study the concept of a fraction, fractions on a number line, comparing fractions, and equivalent fractions. Then in 4th, they study mixed numbers, comparing fractions, equivalent fractions, adding and subtracting fractions and mixed numbers, and multiplying fractions by whole numbers. The answers are at the end of the book.